They have this implant that allows blind people to see. What they do is implant electrodes in your brain, and a sensor in the eye sends signals to the electrodes to stimulate the brain and create pictures. It's still experimental but it works. What if we implanted the sensors on fingertips? 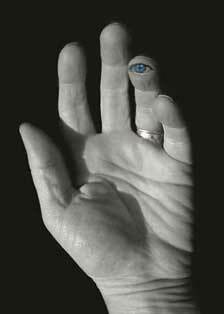 I don't know why, but I think it would be awesome to have eyes on my fingers. Of course, the technology would have to improve a bit to be as good as regular sight, but as I said, it's still in development. For those people that don't want implants in their fingertips, they can get a glove with the sensor. You'd never pick your nose or scratch yourself again. I think I've read all of Card's books. I don't remember that. Wow, in poker you could see all the cards as you were dealing. But, playing the piano or typing would be sheer torture. One doesn't use sight for playing the piano. Well, those for who it is innately imprinted, don't. Back in my auto mechanic days I always wished for this when I was working under dashboards.....but, ah, the exquisite agony when you slammed your finger in a door. It's all good fun until somebody gets an eye put out.